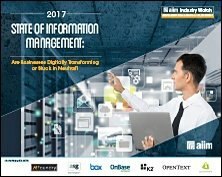 2017 State of Information Management - Are Businesses Digitally Transforming or Stuck in Neutral? Are Businesses Digitally Transforming or Stuck in Neutral? As private and public organizations move to adopt and implement the latest technologies to build out their information management ecosystems and digitally transform their operational processes, there are challenges to be overcome in extending the capabilities—once confined to the desktop—beyond the corporate walls to extended transactional processes. Download this FREE executive summary for a look at the key findings on the current state of Information Management.